04/14/2019 - The Washington Capitals announced today that the club has recalled goaltender Vitek Vanecek from the Hershey Bears. Additionally, goaltender Ilya Samsonov has been re-assigned to the Bears. The announcements were made by Washington's senior vice president and general manager Brian MacLellan. Vanecek, 23, has recorded a 21-10-6 record with Hershey this season, posting a 2.62 goals against average, a .907 save percentage, and two shutouts. He is the first Hershey goaltender to record 20 or more wins since Dan Ellis posted 25 victories during the 2015-16 campaign. Vanecek, a native of Havlickuv Brod, Czech Republic, was honored as the the CCM/AHL Player of the Week for the period ending Oct. 21, and was named to the 2019 AHL All-Star Classic. This is the first NHL recall for Vanecek. He was drafted by the Capitals in the 2nd round, 39th overall, in the 2014 NHL Draft. With the Bears, Vanecek is 52-33-15 in his 110-game AHL career, posting a 2.69 goals against average, a .903 save percentage, and nine shutouts. Prior to joining Hershey, he was named to the ECHL All-Rookie Team with the South Carolina Stingrays in 2015-16. Samsonov, 22, has appeared in 36 games with Hershey this season, recording a 19-14-2 record with a 2.74 goals against average, a .896 save percentage, and three shutouts. Since the calendar turned to 2019, Samsonov has been one of the AHL's top goaltenders, collecting a a 14-4-0-1 record, a 1.93 goals against average, a .923 save percentage, and three shutouts. His strong play helped Hershey move from last place in the Atlantic Division to a playoff position. 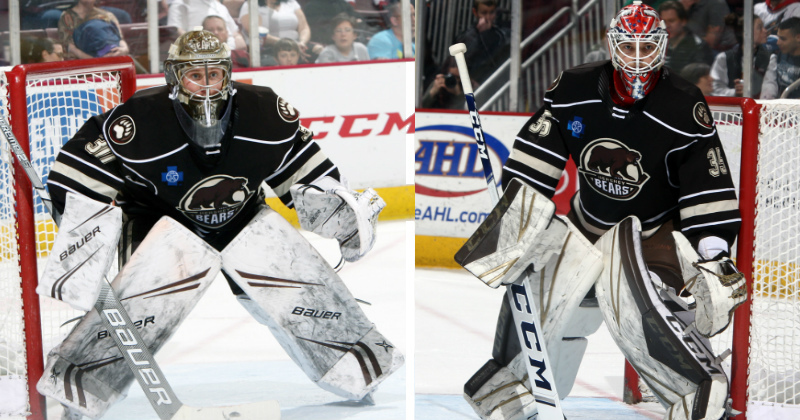 From Jan. 12-Feb. 23, Hershey posted a franchise record 17-game point streak, and Samsonov went 9-0-0-1 in that span. Samsonov was Washington's 1st round selection, 22nd overall, in the 2015 NHL Draft. The Bears return to action for the final home game of the regular season tonight at 5 p.m. versus the Hartford Wolf Pack. Ticket information is available at HersheyBears.com.